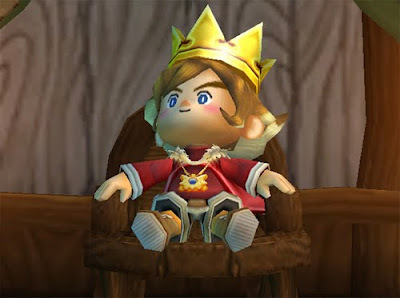 Do not lose a fight while playing Little King's Story. If you do, you will be treated to the most heart-breaking "Game Over" screen I've seen in ages. It's worse than the one we made for Treelings. It even says "Life Over," as if the scene itself wasn't sufficient. The "Life Over" screen is basically a microcosm of Little King's Story. LKS is a creature of contradictory impulses- it's both whimsical and dark, inviting and punishing, simple and confusing. But the good indisputably outweighs the bad, and both people worth listening to and roiling critical cauldron agree LKS is fantastic. It could just be because I've been playing Mother 3 interspersed with LKS, but there's definitely something that feels similar to Shigesato Itoi in Little King's Story. LKS has heart and charm in spades. It's delightful and quite simply, exciting to play. But it's also not afraid of the macabre- there's a beach where spirits of the dead wash up in jars on the shore. It's something that largely has to be played to be felt, but I'll try to relate one particular incident. One of my very first citizens was a female named "Lefty." Lefty stood out from the others and I made her into my first soldier, along with a gaggle of other citizens. Lefty served courageously in our first few battles. Then came the encounter with the first serious boss outside of the simple beginning area. It was a rough go, but when a message flashed across the bottom of the screen saying, "Lefty has kicked the bucket" I was absolutely horrified. Not only is the contrast of such a serious event with such frivolous language shocking, but I had no idea if Lefty would come back the next morning or if she was gone forever. I died completely before I could find out, which prompted the other horrified reaction from above. I'm not sure if it was the named characters, X-Com style, that made this particularly resonant, or something else. Whatever the cause, that oscillation from whimsical to quite literally deadly serious is fascinating and endemic to what makes Little King's Story work so well. Little King's Story is clearly born from a legacy, both blessed and profane. Executive Producer Yasuhiro Wada is most famous for the Harvest Moon series and LKS evokes similar aesthetics of nuturing and growing, albeit with the citizenry instead of crops. The developing Cing was previously most notable for Hotel Dusk: Room 215, which is another very conflicted game. Hotel Dusk had a lot of interesting concepts, but it was mired in needless frustrations which at times caused the game to be nearly unplayable. Fortunately, Little King's Story isn't as hard to love as Hotel Dusk. It still has some usability problems though. I spent a good ten minutes with absolutely no direction at the very opening of the game because I couldn't tell the two sets of bushes that were interactive from the dozens that were not. There are animations you're going to see over and over again (like the little king waking up) that are both too long and unskippable. The text speed advances far too slowly, although not quite as bad as Phoenix Wright, where I was actually unable to keep playing for that very reason. And the save system ... gah. Needless is really the only word I have for it. Even if it was meant to make the game more challenging, all it succeeds in doing is making the game more frustrating. That it's 2009 and a save system like this can still be considered sufficient is shameful (more about that in a few days). It's not even that these little things keep a good game from being great, they're keeping a great game from being legendary. 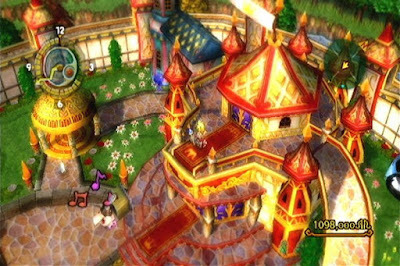 Little King's Story is, without a doubt, one of the best third party titles that has been made on the Wii. Period. As Michael does, I only lament that some people may pass this by without giving it a chance. If you're at all interested in games that do something very different and don't like seeing your Wii collecting dust between the tentpole Nintendo releases, I'd emplore you to give LKS a look. (And if you're in Canada, this is the only place I know of where you can order it.) There's something great going on inside Little King's Story. I hope you take the time to find it. Hahah, yeah. I got a gift card there for my birthday. In any case, I'm just finished the first week or so -- just got the "full" map -- and I'm loving it so far. Hah, I fired a soldier into a pit, and he fell down and died. Poor soldier.